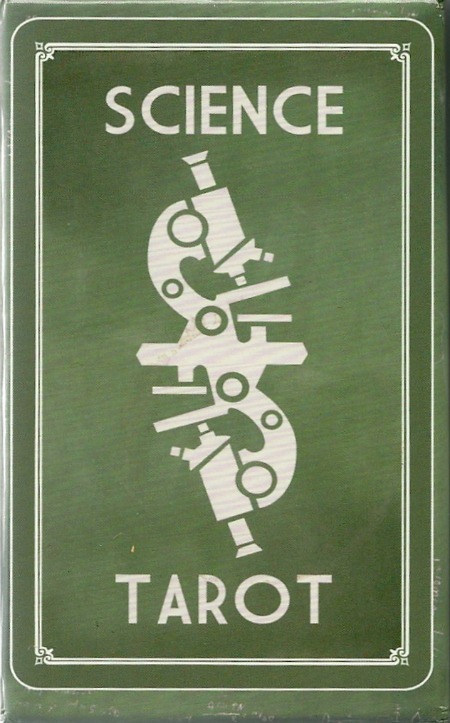 This month I am using the Science Tarot, a deck that has been loaned to me by a dear friend. Liz, the owner of the deck I currently hold in my hands, has a 4 month old baby. Upon noticing that most of her time is now dedicated to the little one, she asked if I would like to borrow her tarot deck for a while. So it is my job to pay these cards proper attention until Liz can once again pick up her deck without having to do a kazillion other things first. And what a deck it is! 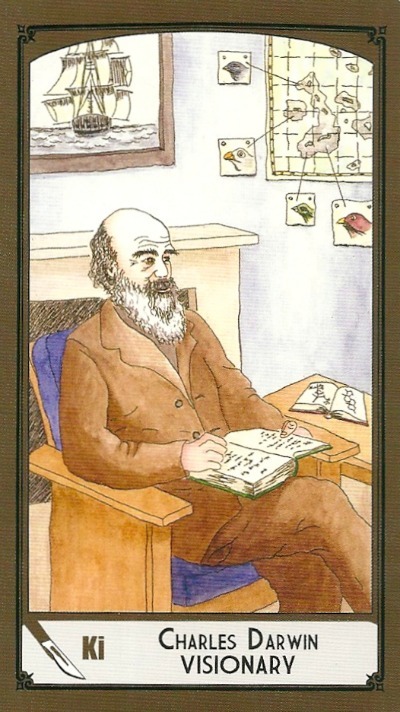 Science and Tarot – do they mix? I think, unequivocally, yes. Although, my approach to science has always had a healthy dose of intuition thrown in, along with the practical. But I digress. Let us talk about May, with the help of this unique tarot deck. First up is Compassionate Action – The Star. 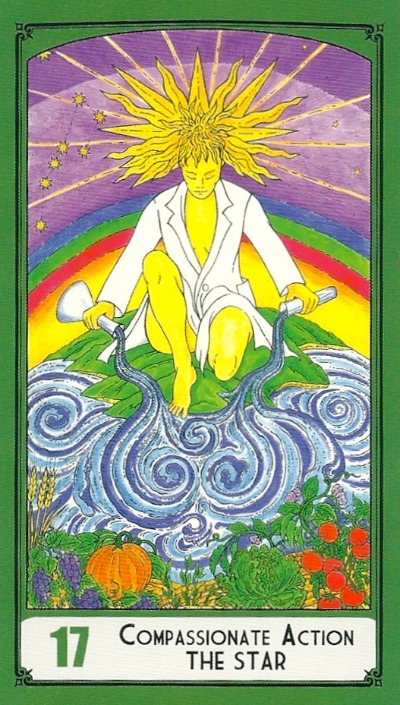 Wearing a lab coat and pouring water onto the earth to help us grow food, what’s not to love? There’s a lot to love about me, true. I am commonly known as being an aid for healing, but what people may not always know about me is how specific I can be with that healing. I don’t just wash over you in a generalised way, I allow you to focus on specific parts of your life that need a bit more attention. My focus is also on aspects of yourself that will come to assist you in the moment if you are willing to uncover some shadows and get to the root of them. There’s no point in concentrating on an issue from the past if it’s unlikely to help you live more fully and authentically right now. So let me pay attention to your garden, and help you cultivate parts of yourself that are beautiful and deserving of more vividness in this world. Thank you Compassionate Action – Star. 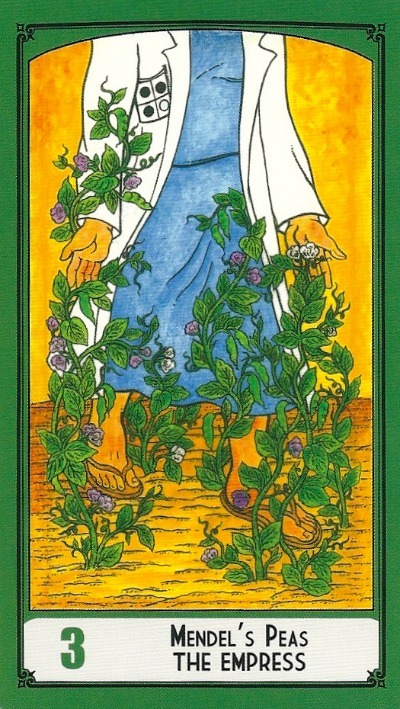 Next up is Mendel’s Peas – The Empress. Hello? Morning everyone. Grab a cup of tea and come and watch these beauties grow with me. Do you want to grow, dear Collective? Good. So stop sowing seeds of negativity and start embracing more love in this life. I’m sick of diversity being seen as something to be merely tolerated. Diversity is extraordinary! We get to learn so much from each other! And also, we get to feel more content within ourselves, as we experience the benefits of sowing seeds of kindness and understanding. Enjoy your walk on the planet this month of May, dear Collective. There’s so much here to enjoy! Well spoken, Mendel’s Peas – The Empress. Might I add to your vision? Of course King Swords – Charles Darwin – Visionary, we always enjoy input from you. Lovely. Well. I would like to help the Collective to be more straightforward in their approach to communication. I would love to remind the Collective to speak from their experiential wisdom rather than just repeating words that others have said. I help remind people of their commitment to understanding, logic and clarity. The Collective would do well to work with me this month. It is always a joy to work with you King of Swords. Anything else to add? Don’t hold back. Be positive and clear in your approach – but don’t hold back. And when you need to take off your thinking cap and relax and open up to nature and all its bounty, come and join me. Hello dear 6 Cups – Return to the Sea. Where shall we meet you? Come meet us by the sea, oh Collective, and dive down deep to rediscover what has been left behind. Too often we may forget to slow down and reconnect with our favourite people and places. 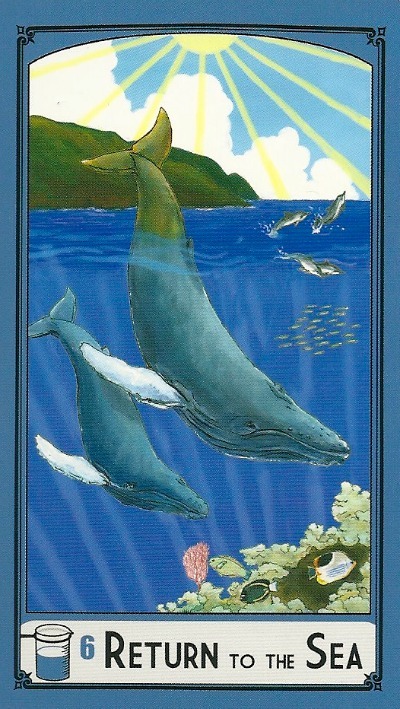 So swimming with the 6 of Cups for the month of May will hopefully remind the Collective that sometimes they just MUST find that spare time, even if they have to say to no to someone in order to find it. Even if it’s only 5 minutes (preferably longer), that downtime will surely recharge you all so nicely that you can face the rest of this strange world with more vigour and aplomb. And I shall help you all ask the questions that open the cracks so there is more room for ignorance to fall out and clarity to come in. Hello Fermat’s Last Theorem – The Hermit. 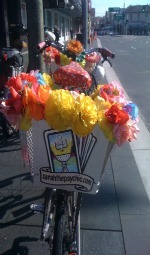 Is there more you wish to share with us? 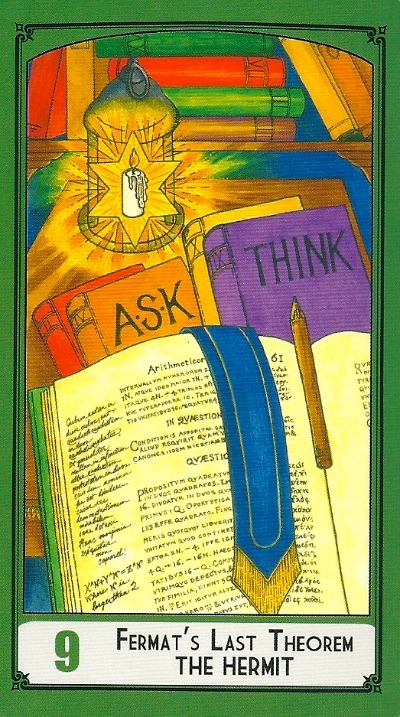 This is not a time for silly questions – that is, questions that just fall out of your head before you’ve thought about it how they might entrench you in a prejudice – but rather, for questions that are honest and clear. I want to help the Collective ask questions that bend around previously unseen corners and that highlight where they may have been led down a false path. This is time to wake up, my dears, more so than ever before. Just having knowledge isn’t enough anymore, we need to DO something with it. Sharing your findings and helping others open their minds through positive encouragement will surely help humanity find a better way forward. Shall we finish off with me? 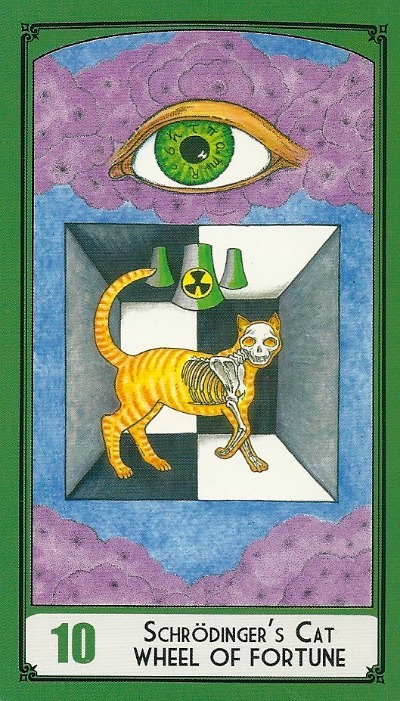 Yes, Schrödinger’s Cat – Wheel of Fortune, if you will. Hopefully the Collective will work together just enough so that the world can keep spinning in a way that promotes healthy living for all rather than just a few. With me on board, the Collective can start to get clearer about what needs they would like to connect with at this stage. Instead of getting lost in strategies and plans that only ever seem to benefit one part of the Collective and not all, I can help create a mind expansion that includes everyone. Of course, in order for this to work, you will all need to be willing to be open to the idea that we are all in this together, and that there is no one ‘right’ way of doing anything. Rigidity has no place here anymore, so may you all find a way to connect with your ideas in a way that honours not only yourself but the beings who share this existence with you.